2014 was just a rough year for SeaWorld parks. The constant barrage of negative publicity from Blackfish and PETA supporters lead to many counting questioning the methods of the marine parks that pretty much set the standards for not only marine animals in human care, but also set a model of the type of care that animals in captivity should receive. That lead to stocks plummeting, and flat attendance. The chain fought back with a hefty messages about conservation, and made that the goal of many advertising, and social media campaigns. The chain also announced that it would be initiating the “Blue World Project” that would not only expand the size of the Orca tanks, but will also match funds for wild Orca research. As great as the Blue World Project will be, activists saw it as admittance of guilt. If that wasn’t enough, longtime CEO Jim Atchison stepped down from his position, and had two new members of the board added, which included an ex politician, and an ex banker. To add even more fuel to the fire, the company laid off over 300 employees, among those, the three beloved mimes from SeaWorld Orlando. 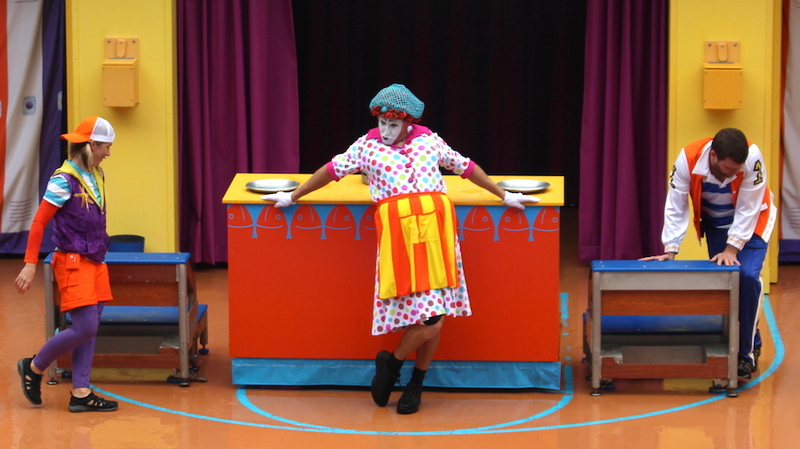 Fans continue to show support for the mimes and the park, but critics and activists are trying to keep their voices relevant by constantly bashing anyone who speaks up for the park, and pushing agendas via online petitions. What is SeaWorld to do? The path might be as simple as looking at a map. 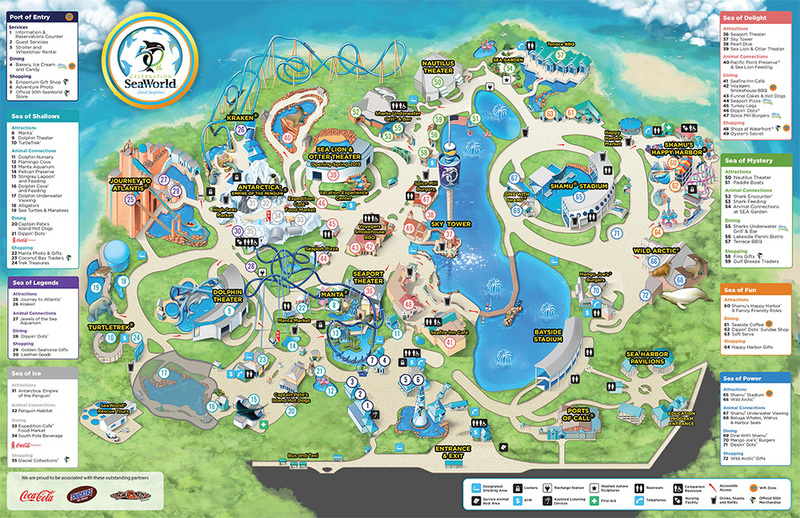 The all new SeaWorld Orlando map for January shows off the park as it is today. It also gives what could be a possible hint for the future. It appears that the all new map divides the park up into different sections, or seven “Seas” and one “Port of Entry”. So, you have the “Seven Seas of SeaWorld, very clever. The different Seas are laid out to the different types of experiences and attractions that you can find in those areas of the park. 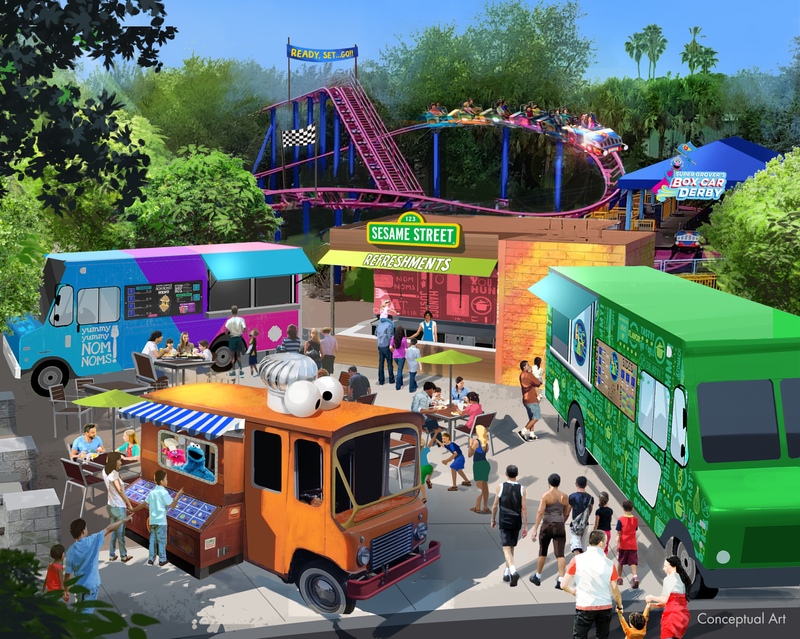 This is a great new way to divide up the park, and put the focus more on the fun aspect of SeaWorld. While it’s hard to imagine that the park will abandon the conservation message, it looks as if the park will have a new message. SeaWorld is fun. Plain and simple. Apparently, the map has been listed on the website for a while, but it still points to what could be coming to the park. That’s the whole reason why people fell in love with SeaWorld in the first place. Sure, you could learn some great things about really powerful animals, and have great connections. You can also get that at any zoo, though some zoos are really amazing. No, SeaWorld is a theme park, first and foremost. The message that it spreads, it spreads through education and FUN. Why is this so important? As we said before, SeaWorld is coming off of a rough year. 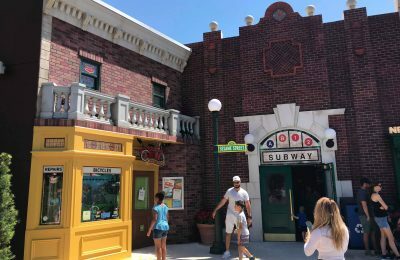 The park has just announced it will be restructuring, and revamping how it does things. That’s very evident in how the park started off the new year. The show, Allure:The Call of the Ocean had it’s final curtain call over the weekend(click here), and the Pearl Divers will be gone in mid February. While that is, at the core, a cost cutting measure it’s also the start of something bigger. In the past week, survey crews were seen around the theater, and the lake. Why would there be survey crews, if there was nothing happening? The lake surveys more than likely are tied into Blue World Project, but the Nautilus Theater? That’s a new one. On top of that, January 5th saw the closing of Dolphin Cove, without any warning(click here). It is listed on the website as being closed for only a month, but from what we’ve been hearing, it could be a much longer down time, making room for some big changes on the cove. If you still want to see dolphins, no worries, Dolphin Nursery is still open, and they have the cutest kind of dolphins…the babies. The bottom line is that SeaWorld is fighting back in the best way possible, by changing. That’s what you do when things aren’t working the way you like, you find a way to make them work. Speculation ran rampant in the days following the departure of CEO Jim Atchison that the park projects would be put on hold until a new CEO could be put in place, but that doesn’t seem to be the case, as SeaWorld San Diego is already going to the planning stages for Blue World Project, which is supposed to start later this year. The park will also see an all new Clyde and Seamore show opening up later this year, so it seems that despite the new regime changes, progress is still marching on. So what about Shamu? After all, the Killer Whales are the center of all the controversy and grief about the park. To find out the answer to that question...again…look to the map. The section where Shamu stadium is located is called “Sea of Power”. That is a stark contrast to “One Ocean” and “Believe” where Shamu is more of an inspiration. Power suggests something else, such as the most powerful creatures in the ocean. It also suggests education, giving more information about the animals, after all knowledge is power. Could we be seeing a return to something like “Shamu Adventure” where the goal was education about these magnificent creatures through entertainment? Nothing has been released or even rumored, this is just pure speculation on our part. So, those hoping to see SeaWorld close shop, and get sold off…sorry to disappoint you. SeaWorld appears to be on the eve of change, with more than just one message, and one way to get it across-through FUN! Stay tuned for even more from SeaWorld and be sure to get social with us on Facebook, and follow along with us on Twitter @BehindThrills for the latest updates! For more information about SeaWorld Orlando, including tickets, visit the official website by clicking here! Previous PostChanges happening at SeaWorld Orlando as Allure has final show, and Dolphin Cove goes down for rehab Next PostTop 3 Theme Park Websites of 2014, as voted by you!